The Kings & Queens Elizabeth 135cm is a modern style corner cat tree that ooze all the style and sophistication of Queen Elizabeth! The compact and simple design of this cat tree really sets it apart from the crowd and you can be sure that your feline will simply love to explore everything that this stunning masterpiece of kitty construction offers! 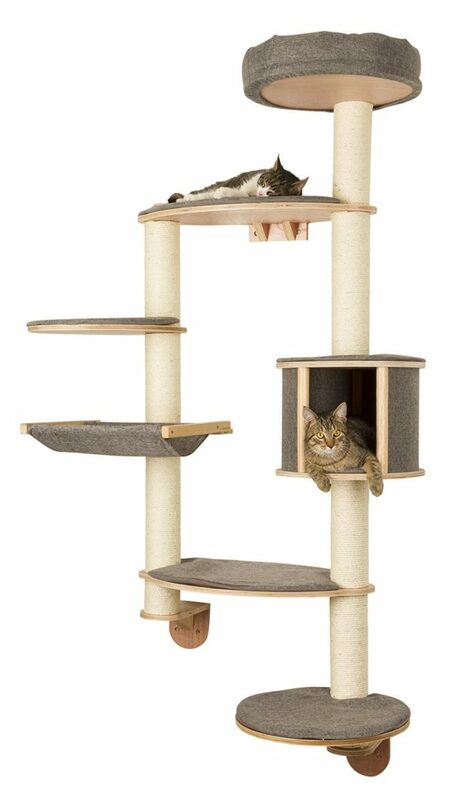 The entire cat tree has been covered in gorgeously plush material and the sisal scratching posts have been matched puuurfectly to the overall design as well. A funky plush hanging ball is mounted on the upper deck which adds a bit of spice to your kitties playing experience. The 4cm thick baseplate holds everything together very tightly and ensures that no matter how mad your feline gets, they will be able to enjoy this cat tree is safety and security. This also gives pet owners peace of mind that you know their kitty has a cat tree that is made to last! The Kings & Queens Elizabeth stands firmly on the ground at a mighty height of 135 and is suitable for all breeds of cats and agility levels.